Years ago, during a television special touting the use of computers, a narrator breathlessly announced that soon new software was going to remove all of the drudgery from animation. 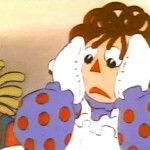 A remarkable video fragment showed a Raggedy Ann character that had been painstakingly rendered using the computer. The clip was short, but impressive. The drawings merged and drifted from one to the next with perfect, mechanical calculation. Yet there was something dreadfully wrong. Raggedy Ann just didn’t look right, and certainly didn’t move right, and the results were entirely unacceptable. No matter what software you use, computers aren’t good at giving drawings that human touch. The computer is a brilliant tool for removing the tedium, yet it doesn’t remove the need for hard work and focused effort. There are no shortcuts for genuine quality—anything that’s difficult for you to accomplish will be even more difficult for a computer. Or worse yet, your robot servant will cheerfully accomplish the task you assigned it, and the results will be just what you would expect from a robot. Does anyone remember seeing this? Years later I can only assume that this was some kind of research done around the time Richard Williams was animating “The Raggedy Ann Movie.” Obviously his team did not use the technology for the feature; maybe they had the same feeling about the quality.